Spice Williams-Crosby (born Marceline Ann Williams, April 26, 1952) is an American actress and stunt performer, with a career in film and television which spans over twenty years. Williams-Crosby was born in North Hollywood, Los Angeles, California. 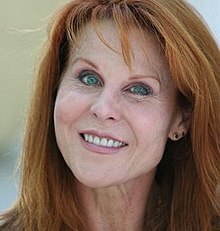 Her more notable roles include the Klingon officer Vixis in Star Trek V: The Final Frontier, and the assassin Patrice in Buffy the Vampire Slayer story "What's My Line". Originally involved in music and dance, she switched to acting, focusing on action roles which often featured stuntwork, making use of her martial arts and athletic skills. She has also worked as a stunt coordinator, choreographing fight scenes for television and film, including Miller Lite's controversial 2002 commercial "Catfight". Williams-Crosby took up personal fitness at the age of 26, including bodybuilding and nutrition. She is a third-degree blackbelt, a noted vegan, and has written a book and several articles on the subject. She is married to screenwriter/film producer Gregory Crosby ("Hacksaw Ridge"), grandson of Bing Crosby; the couple have one son, Luke Gregory. ^ "Bio". The Official Site of Spice Williams-Crosby. Retrieved 2007-09-21. ^ "Spice Williams Interview". FamousVeggie.com. 2000. Archived from the original on 2007-04-05. Retrieved 2007-09-21. ^ Williams-Crosby, Spice. "The Science of Thought". AllYourStrength.com. Retrieved 2007-09-21. ^ "The Spice in Spice of Life". Archived from the original on 2011-07-16. Retrieved 2007-09-21.